Yes! 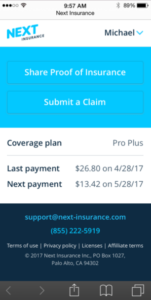 When you click “Share Proof of Insurance” from within the customer portal, you’ll be asked if you need a general proof of insurance or one with a venue or client as additional insured. As soon as you input the details of the additional insured you’re adding, you can add their email address and we’ll send them over the certificate for you. Can I still get my ACORD certificate? Yes, you can. When you are logged into the customer portal and viewing your Live Certificate, you can click “view details” and then “View ACORD certificate” to see the PDF version. What information does my Live Certificate include? Your Live Certificate includes all information that’s relevant to your insurance policy, including your limits, deductible, type of policy, and contact information such as your address. Who can view my Live Certificate? Anyone you ask us to send your Live Certificate to can see it. If you send your Live Certificate to anyone through a link, they will also be able to see it. You control who has the link to your Live Certificate, and who receives it by email.